You know how we're an art family...: eggs, eggs everywhere AND a giveaway! I have grand plans for how I want to celebrate Easter, at least as far as the egg hunt goes, so I wanted to start plenty early to make sure I got everything done. First off, Finn's getting old enough that I thought he might want an Easter basket, but the thought of buying another plastic basket makes me cringe. So I got a grand notion into my head that I'd crochet him one, without a pattern, of course, and well...I guess it will at least hold eggs. The basket, if you can call it that, has no shape and flops over at any chance it gets, but it's starting to grow on me. 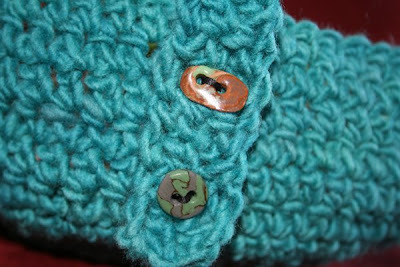 The one thing I do love about Finn's new basket are the buttons I used to attach the handles. They are handmade buttons that Paul found at a local craft guild shop and tucked into my Christmas stocking. Now how can you dislike a basket with such fancy buttons?! 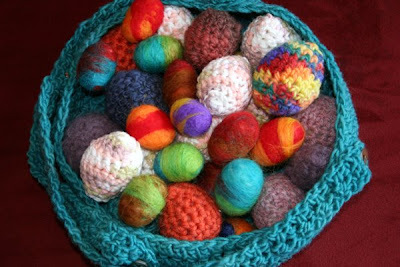 For a couple of weeks now, when I have a spare minute or two, I've been crocheting and needle-felting eggs of all colors. I've tried to do as many as possible when the kids aren't around because they become little beggars when they see my cute little Easter eggs. Hopefully, they will still be as fascinated come Easter. 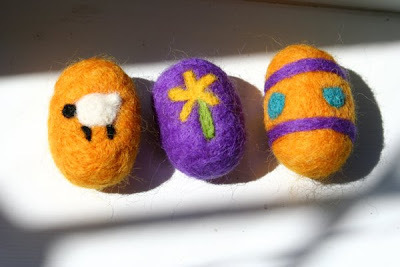 And while I was needle-felting all those eggs, I noticed that my blog post count is climbing pretty high, and that in the next few days, I'll have 200 posts. 200!! 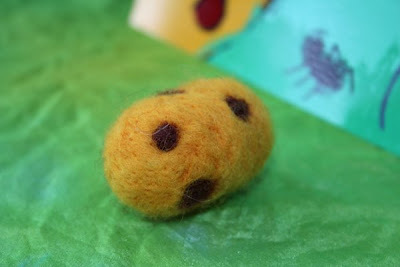 I thought I'd celebrate my blogging perseverance by doing a needle-felted egg giveaway. That's right...all three of the eggs pictured below will be given away to one randomly drawn name from the comments of this post. So de-lurk now and comment! Speaking of eggs, I also made this cute little spotted egg for our nature table and thought he needed a story to accompany him. 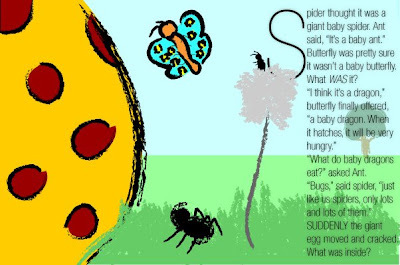 My sweet husband wrote and illustrated a story card to sit with the egg on the nature table. Didn't he do a fantastic job? I'll draw a name from the comments on Saturday noon EST. The winner, as chosen by the random number generator is #14, Erin from Wild As Weeds. Congrats, Erin! If you'll email me your mailing address, I'll send these right out. Me, me, me. And this is yet another reason to go to Winston. It appears that the only reasons I will drive a whole 20 miles down the road are omelettes and buttons. Your basket of eggs is adorable... your lucky children! 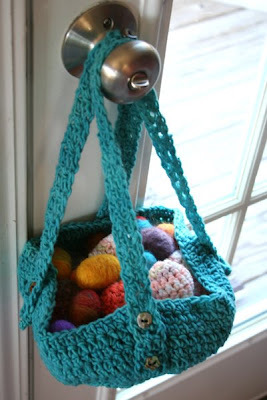 I'd love to win your giveaway too... those felted eggs are gorgeous! Well...Im no lurker... and regardless of the giveaway, I have to say those eggs and that basket are darling. Good job! Ooh, ooh, ooh, pick me! How absolutely adorable! And I love the story, too! Very cool blog. Oh, I am drooling over all your felted eggs! And I love the basket!! Are you for real???? These are the cutest eggs ever!!!!! How lucky the little guy is. I really LOVE all the eggs...so much better than those plastic ones! Hi Joy, thanks for visiting my blog. Those eggs sure are cute -- I like the one with the sheep! Those eggs are so cute! And now I'm feeling motivated to get out my wool and do some felting. SOOOOO cute. I'm jealous that you are so accomplished in your crocheting. I've just begun and am still learning. Here's hoping I'm the lucky one! Those are some great eggs! I've needle felted one egg so far...and it took me a long time to do so. Your husband's story is so sweet. How nice of you to have a giveaway. I love these eggs!!! And 200 posts? Congrats. I love all your eggs and your basket! Your blog makes me happy, you know that??? Those are some darling eggs, and a darling basket, and the little story about the egg is so sweet. Your eggs are lovely!!!!!! I've been trying to work out a knitted egg pattern, but not much success so far... My daughter crochets. Maybe she could work something out. :) Put us in the drawing!!! I had never seen a felted egg until just recently at Dawn's house. And now I think they're soooo cool! Love yours, too. And the basket. With the super cool buttons. Oh Joy, those eggs are gorgeous. I would love to give them a new home. What a lovely giveaway.